rec. CD1: October 1957 [1-3], February 1975 [4-5] and April 1984 [6-7]; CD2: May 1956 [5-9], January 1965 [2-4], February 1965 [10-12] and September 1980 ; CD3: rec. February 1975 [13-14], July 1976 [1-6, 10-12] and September 1976 [7-9]. Digitally re-mastered from Supraphon sources. ADD. stereo except Concerto and Divertimento. If you are at all familiar with the LP production of the then Czechoslovak company Supraphon you will know the name of this composer and of Zuzana Ruzickova. That said I had no idea that there were so many Kalabis Supraphon recordings. This is presumably everything? I also had no inkling that Ruzickova, whose name I know from recordings as a harpsichordist, was also a pianist or that she had been a survivor of Auschwitz and Belsen. Kalabis met her in 1951 and they were married in 1954. The Piano Concerto No. 1 was the composer's wedding gift to Ruzickova in 1954. She continues the promotion of Kalabis through the Kalabis Foundations in the USA and the Czech Republic. Kalabis wrote five symphonies, two violin concertos, as well as concertos for trumpet and harpsichord. There are seven string quartets (I would very much like to hear those) the same number achieved by Martinu, a composer whose music he worked for indefatigably as President of the Martinu Foundation and Institute between 1990 and 2003. The Piano Concerto No. 1 is a bright-eyed romantic piece, very tuneful and brilliant yet with, youth heart and wit. One might very loosely group this delightful work with the piano concertos of Kabalevsky and the second Shostakovich. Recorded in a resonant acoustic the two movement Fourth Symphony is a different proposition. It broods with towering intensity and even the composer's many excursions into chamber and soloistic episodes here have a toughness about them. The glowingly warm wattage of the violins of 2:40 forwards in the first movement offers some relief - a transformation of the initial callous ideas. Brilliance, but again some hardness, overarches the fast-pulsed violins of the second movement which is more explosive: freighted with torment as well as tenderness. The final shudderingly violent pages have the edgy energy of William Schuman. The symphony was commissioned by the Dresden Staatskapelle for their 425th anniversary where it was conducted by Herbert Blomstedt in pre-Perestroika days. The ballet Two Worlds is based on a Lewis Carroll's Alice in Wonderland. There's more than a touch of Martinu about this score with occasional invasions from Stravinsky. It's a grown-up score with clamorous and sometimes jazzy tendencies and some translucently fantastic chamber-style writing. The second movement conjures up, with a different accent, the same diaphanously fairytale fantasy that we hear in Ravel's Ma Mère l'Oye. The presence of orchestral piano amid this glimmering skein of sound again emphasises the Martinu affinity. This 1980 television ballet seems to have done well in both the USA and the Republic. The Fifth Symphony is in a single formidable fifteen minute movement. Once again the rushing athletic music of William Schuman comes to mind right at the start. This is in combination with the furies buzzing away like a frenzied variant of the insect noises at the start of Martinu's Fantaisies Symphoniques. Nothng neo-classical about this. After this the music retreats into a sometimes haunted spectral world shaken by outbreaks of violence. The Chamber Music for strings is played by the commissioners: the Prague Chamber Soloists directed by Vaclav Neumann. This is another Kalabis string orchestra work which manages to combine tenderness with dark-clouded occlusion. It comprises a fairly austere allegro vivo book-ended by two slower movements ending in an understated tenderness from the sighing viola and soft-breathing violins. The Wind Quintet of the Czech Phil play the 1952 Divertimento. It would play nicely alongside the Mozart quintet. Delightfully innocent music-making, pastoral accents and full of original touches. The Second Quartet is played by the great Vlach Quartet. John Solum (surely the same person as the same accomplished flautist recorded by EMI in the 1970s in the Arnold flute concertos) in his invaluable and sympathetic notes (fashioned from commentary by Ruzickova) tells us that this work was written the shadow of the impending death of Kalabis's father who is also the dedicatee of this three movement work. It's an unsurprisingly spiky, unforgiving work, raging against the darkness, with little tenderness until we reach the finale - Epilogue: Adagio. This is memorably poignant with its Bergian moonlight, trembling intimacy and arpeggiated ostinato. The third CD is entirely of chamber music. The Six two-voice Harpsichord Inventions are from 1962. These are good-hearted life-enhancing miniatures written for and dedicated to Ruzickova. They are said to have been inspired by Bach's duets and by the works of Domenico Scarlatti. Kalabis contrives to avoid any sense of pastiche or the archaic. The music is very brilliant and full of character. For some reason it reminded me of those imported Czech children's adventures of which the best was The Singing Ringing Tree, shown on British television in the 1960s. The Sonata for Violin and Harpsichord is not in the least neo-Baroque despite the instrumentation. It is played by Ruzickova and Josef Suk who took it to concerts all over the world. This 1967 work plays for just over fifteen minutes. It is passionate, emotionally tumultuous and seriously impassioned as are the two symphonies included here. The 1974 Piano Trio is played by the elite of the Czech musical aristocracy: Panenka, Suk and Chuchro. It's in three movements. Once again it's succinct - all done and dusted in about quarter of an hour. There's a pierrot moonscape at the centre and a metamorphosis of the Furiant for the finale. Its passion reminded me a little of John Ireland yet with Stravinskian accents. We end in the quirky company of the two movement Trombone Sonata of 1970, a sort of serenade with nobility mingled among the chivalric song. By the way I am not sure why the otherwise admirable note-writer correlates poor audio-technical engineering with the Communist regime. In any event, as he says, the recordings are allowing for age in good heart and even the oldest (Concerto and Quintet) sound clear, detailed and vivid. Perhaps the 1970s orchestral works sound shriller than they might in the violins. To associate politics with engineering performance is as misplaced as linking the quality of a composer's output with the Communism of the regime in which he works. In any event it should be noted that Kalabis despite his brave dissent achieved far more recordings under that regime than the overt Communists Alan Bush and Alfred Corum (awaiting discovery) did in the UK under a different political system. 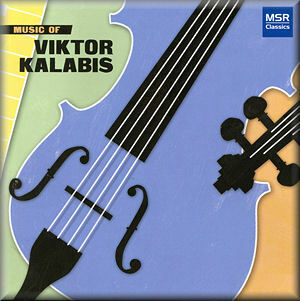 It should be noted that there is a Supraphon CD dedicated to three of Kalabis's orchestral works. This collection would never have been possible without the cooperation of Supraphon and the commitment of The Viktor Kalabis and Zuzana Ruzickova foundations in the Czech Republic and in the USA. This admirable boxed set is further distinguished by a wonderful 1960 photo of Ruzickova (my mother had those ‘Dame Edna’ winged spectacles too!) and Kalabis in the shadow of Prague Castle. The smiling portrait of the couple in their sixties can be found on the back page. The inside back cover of the triple case has a portrait of the couple with Rafael Kubelik. This set is marked as a ‘limited authorised edition’ so do run it to ground before it disappears. I hope that MSR will be able to repeat the experiment with other Czech composers of the era: Kabelac, Jezek, Vycpalek, Pauer, Dobias, Hanus and Burghauser.